Petrels and guests are cordially invited to tour Fairbourne House on Saturday, May 30th. The address: 3691 Rees Road, Richmond. Time: 1 o’clock pm. Light refreshments will be served. Please mark your calendars. If you have any comments or questions about The Stormy Petrels of B.C., or a contribution for the Petrel Flyer, please send a message through our Contact Form. You can also find us on Facebook. 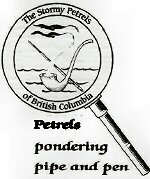 Since 1987 The Stormy Petrels of BC, a scion society of The Bootmakers of Toronto, have been an active group devoted to the study of Sherlock Holmes, his cases and methods. They hold regular monthly meetings as well as special events throughout the year. The activities and musings of the Stormy Petrels are captured in the society’s publication “The Petrel Flyer”, written by its members for its members.